Traditionally there were two main approaches for implementing enterprise-wide risk management and treasury systems. Either a system was developed in-house or it was acquired from an independent software house (i.e. either "Build it" or "Buy it"). Building your own system in-house can offer a number of advantages, including giving the firm complete control of the features of the system and the ability to keep certain features proprietary. However, a perennial problem when building systems in-house was accessing common data structures and algorithms (e.g. analytical models for derivative pricing and risk management sensitivities) without re-inventing the wheel every time when working on different systems (e.g. front office, middle office, back office). Whilst techniques such as analytical add-ins and toolkits were commonly used, the issue of combining everything into a working system (with an integrated data model) remains a complex and time consuming task. Having developed the system in-house, many firms have subsequently found that, with the high mobility in technology staff, the original in-house developers were not always available in future to enhance the system. Also, with the system only being used by one firm, the cost of the development, and the continuous R&D into future enhancements, could be a high burden for that firm to shoulder. The alternative of buying a complete system can present a number of advantages, including speed of implementation (since the system has already been built and tested) and cost (due to the economies of scale of selling the same system to a large number of firms). Indeed, for small software package (such as word-processing and spreadsheets), buying a package such as Microsoft Office (or acquiring a free copy of StarOffice) is the rational thing to do. However, in the case of enterprise-wide risk management and treasury systems, the potential user base is much smaller than for the "mass market" office applications, and the requirements are much more diverse and complex (including the need for extensive training, security and audit logs). This diversity of requirements, taken together with the large number of software houses targeting the financial sector, has been a factor in preventing any single software house from having a low-cost mass-market enterprise-wide system which dominates the financial market in the same way as Microsoft Office dominates the office productivity segment. Therefore, the cost of enterprise-wide systems have typically been very high. Other possible drawbacks of buying a complete system include a lack of flexibility since the user is usually totally reliant on the independent software house to provide all enhancements since the user typically does not have access to the source code and is therefore unable to modify and enhance the system in-house. Most firms, due to their inability to find a single affordable system which did everything required, acquired a number of different systems specialising in different processes, with the resultant difficulty of real-time integration - especially at the enterprise level. It has also been the experience of many firms which did acquire enterprise wide systems that the time to implement the purchased system is much longer and costlier than anticipated. In addition, when "buying" a system, the end user is sometimes only acquiring a right to license the system for a number of years, instead of acquiring a perpetual licence. The purchaser also needs to be cautious of "purchase" contracts which may include clauses which limit the use of a system to a certain trading desk or department since, if that desk or department is closed, the licence to use the purchased system would terminate. Recognising the advantages and shortcomings of the above two approaches, a third approach for implementing systems is the collaborative partnership approach between a software house and the end user. This is where both the software house and the end user recognise that, in this fast moving and complex market, the resources required for undertaking either of the two traditional approaches above is massive. The collaborative partnership combines the best features of the two traditional approaches. Substantially increased speed of development due to use of a pre-built and tested environment. Free upgrades and enhancements performed by other members of the MBRM development partnership program. Reduced cost of enhancements since these could, if desired, be performed in-house. Reduced chance of errors due to use of object technology which centrally holds the business logic or algorithm for a task. The ability to outsource the development of some of these algorithms (e.g. exotic option models) to specialist software houses. This could reduce costs, provide extra flexibility and implement new market tested analytical models. The benefit of being in contact with other members of the program in order to discuss ideas and common business issues (such as automatic confirmation between counterparties using XML). Whilst the one-time joining fee for the program is currently waived for new members, the joining fee is likely to increase substantially in future as more members join the program. Therefore, early members of the program would enjoy a considerable cost saving. For maximum flexibility, the members have NO commitment to use MBRM's consultancy service. Whilst the MBRM development partnership program may not suit every client's requirements, it does provide an important "third" approach which should be investigated whenever contemplating any system change. Indeed, we believe that it does offer the best approach to most end users. Dr. Mamdouh Barakat is Founder and Managing Director of MB Risk Management. Founded in 1988, MBRM are pioneers of the financial add-in and toolkit market segments. MBRM are developers of the world-famous UNIVERSAL Add-ins. With 30,000+ users world-wide, the UNIVERSAL Add-ins are the most widely-used derivative software for the pricing, risk management, trading, arbitrage, fund management and auditing of securities, options, futures and swaps in the convertible, fixed income, commodities, energy, equities, foreign exchange and money markets. 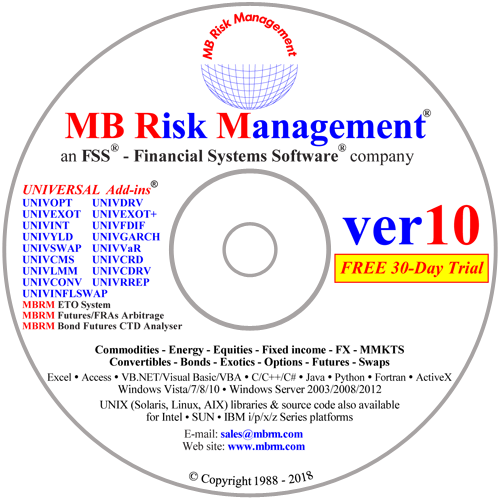 MBRM's software is used world-wide in mission critical applications by most major Investment Houses, Money Managers and Corporate Treasuries.